Hardware to install park lights on 1968 Camaro standard park lights. Reproduction of the park light wiring grommet for all 1967-69 Camaro RS models. Sold in a pair. .
High quality chrome. Accurate park lamp reproduction shouldered lens screws for 1967-68 Camaro Rally Sport: Correct replacement screws needed to install the park lamp lens. This kit includes the essential screws for a complete installation. Also used for 69 Camaro back-up lenses. Includes a set of 4 screws. 1967-1968 RS Park Lamp Lens to Housing Gasket: Gasket used to seal the RS park lens to the housing assembly. Each gasket is stamped with a steel rule die insuring an exact fit. Sold in pairs. 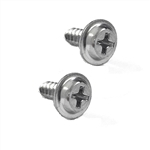 High quality chrome shouldered lens screws for 1969 Camaro Standard and Rally Sport models. Correct replacement screws needed to install the park lamp lens. Includes a set of 6 screws. Park light housing gasket, Rally Sport, Molded rubber sold in pairs. Nice high quality reproduction of the license lamp lens for all 1967-69 Camaro and Firebird models. Includes original "Guide SAE" markings on lens.